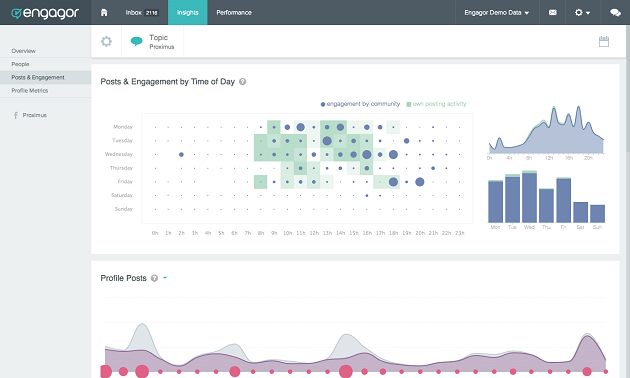 Engagor is helping its users determine the best time to post on social networks, thanks to its redesigned analytics solution, dubbed Insights. Gender and Age Demographics – Users can sort age and gender insights by social channel. For instance, users can discover what type of posts women between the ages of 18-24 engage with the most on Twitter. Best Time to Post – Users can identify the best time for optimal engagement. For example, the solution’s new visual charts show when content is being posted and when the community is most actively engaging with that content (see image below). With these insights, users can optimize their targeting and timing.